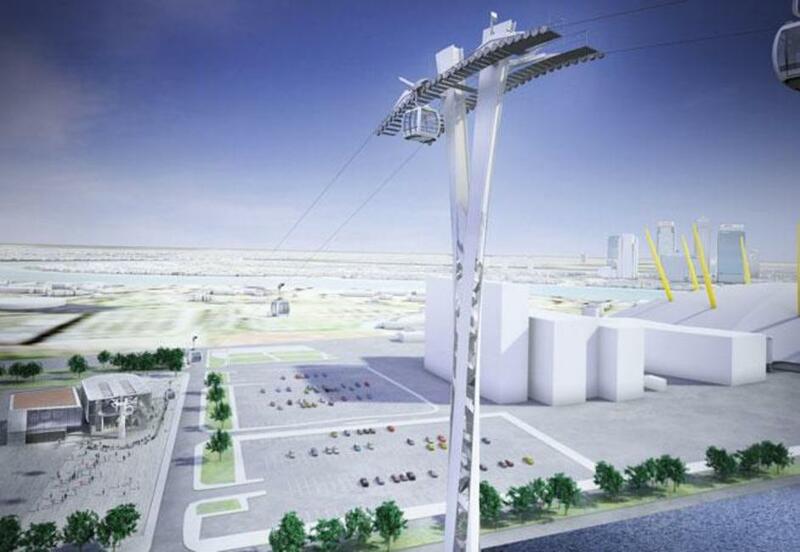 One of Mayor Boris Johnson's big initial plans for London 2012 was this cable car link across the Thames from Greenwich Peninsula to the Royal Docks. Similar to the service that operates between Manhattan and Roosevelt Island in New York, the Thames Cable Car - now officially named the Emirates Air-Line after a 10-year sponsorship deal with the Dubai-based aircraft carrier - will connect Olympic venues the North Greenwich Arena and the ExCeL exhibition centre. At 1km in length and running around 60m above the Thames, the cable car will provide a "much-needed river crossing" and a "bird's eye view" of the capital, according to Boris. Crossings are planned every 30 seconds for up to 2,500 passengers per hour in each direction, and views will be fairly spectacular. Bikes will be able to be transported with passengers, who will also be able to tap in using their Oyster Cards (prices to be confirmed). Work started in July 2011 on the 60m gondola-style project - the first urban cable car in the UK and the most expensive of its kind in the world - and construction was completed in May 2012. The cable car is set to open on June 28th at midday. For more information on the Emirates AirLine read our full feature on the Thames Cable Car on our London Olympics pages. What are the best dining options near Emirates AirLine (Thames Cable Car) London? Emirates AirLine (Thames Cable Car) gyms, sporting activities, health & beauty and fitness. The best pubs near London Emirates AirLine (Thames Cable Car). Emirates AirLine (Thames Cable Car) clubs, bars, cabaret nights, casinos and interesting nightlife. Where to have your meeting, conference, exhibition, private dining or training course near Emirates AirLine (Thames Cable Car). From cheap budget accommodation to luxury 5 star suites see our special offers for Emirates AirLine (Thames Cable Car) hotels, including Good Hotel London from 91% off.